Will ‘slow earthquakes’ along central San Andreas trigger larger quakes? 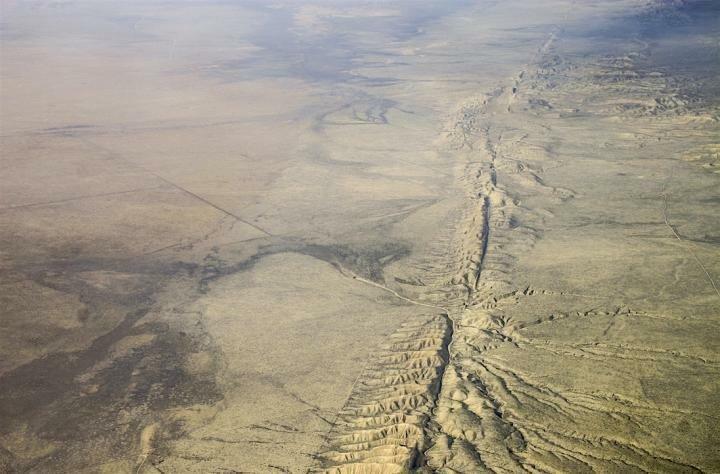 The earthquake-prone San Andreas fault slices down the length of California. Photo via U.S. Geological Survey/ASU. … the activity has been a sequence of small stick-and-slip movements – sometimes called slow earthquakes – that release energy over a period of months. Although these slow earthquakes pass unnoticed by people … they can trigger large destructive quakes in their surroundings. One such quake was the magnitude 6 event that shook Parkfield in 2004. What looked like steady, continuous creep was actually made of episodes of acceleration and deceleration along the fault. We found that movement on the fault began every one to two years and lasted for several months before stopping. These episodic slow earthquakes lead to increased stress on the locked segments of the fault to the north and south of the central section. Shirzaei pointed out that these flanking sections experienced two magnitude 7.9 earthquakes, in 1857 in Fort Tejon and in 1906 in San Francisco. 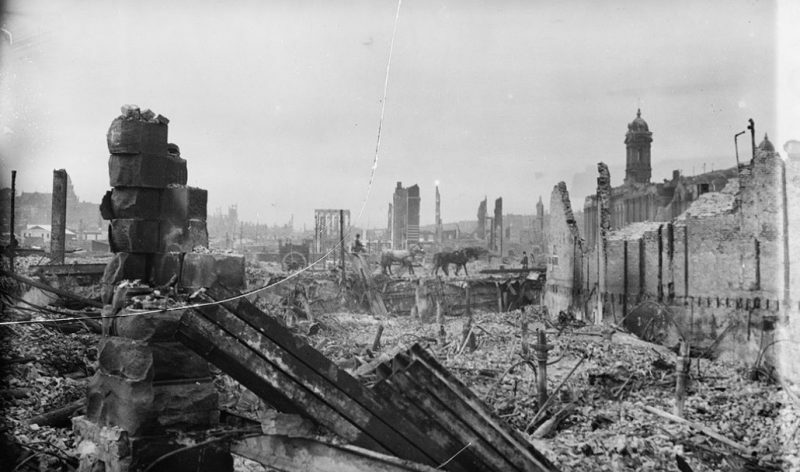 Aftermath of the 1906 earthquake in San Francisco. Image via Arnold Genthe (public domain)/KQED-San Francisco. We found that this part of the fault has an average movement of about three centimeters a year, a little more than an inch. But at times the movement stops entirely, and at other times it has moved as much as 10 centimeters a year, or about four inches. They noted that the new observation is significant because it uncovers a new type of fault motion and earthquake-triggering mechanism, which is not accounted for in current models of earthquake hazards used for California. Based on our observations, we believe that seismic hazard in California is something that varies over time and is probably higher than what people have thought up to now. He added that accurate estimates of this varying hazard are essential to include in operational earthquake-forecasting systems. Meanwhile, a second recent study – from Susanne Jänecke at Utah State University – pointed to a site in southern California as the possible future site of the next major earthquake on the San Andreas fault. In their new paper for the peer-reviewed journal Lithosphere, Susanne Jänecke and colleagues use detailed geologic and structural mapping of the southern 18.6 miles (30 km) of the San Andreas fault zone in southern California to show that it is a highly faulted volume of rock, which they called a Durmid ladder structure. They pointed to this region as the possible nucleation site of the next major earthquake on the fault. And they called for more studies of the region to document the location and geometry of the fault zone, so that scientists can evaluate the hazard. According to U.S. Geological Survey earthquake models, there is a 75 percent chance for a 7 magnitude or larger earthquake in northern and southern California within the next 30 years. Bottom line: New research from Arizona State University shows that movements along the central section of the San Andreas fault haven’t been smooth and steady, as previously thought. It also shows that episodic slow earthquakes along the central San Andreas don’t relieve stress; instead, they cause stress, which may trigger large, destructive earthquakes.